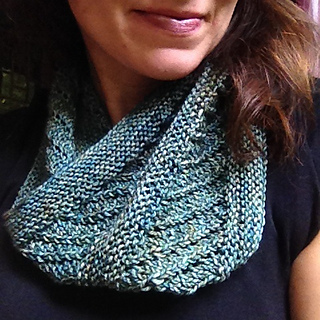 Upside-down and right-side-up are interchangeable in this fun, quick, and easy cowl knitted in the round. 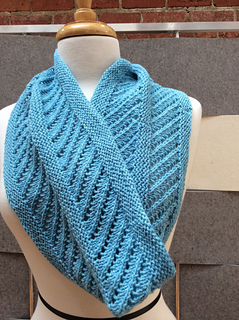 Although specific yarn brands are suggested, the cowl can be worked in any similar sport weight, including handspun. A handy instruction chart will help track your progress and yardage as you knit. 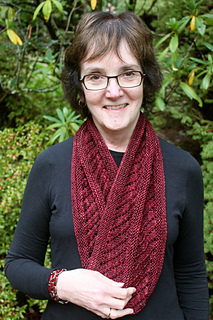 The simple lace pattern is suitable for most yarn types, including variegated. Skill level: Confident beginners and up. The lace pattern is one line and easy to memorize. Have you ever wanted to buy a beautiful skein of sport weight yarn but had no idea what you would do with it? The small size was designed to fill this need. 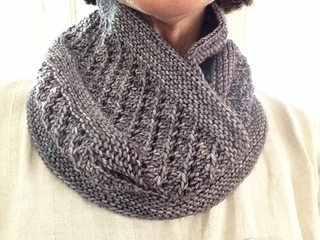 Small Cowl in photos is Leading Men Fiber Arts Callback in the Envy color way. This pattern was technically edited by Bronwyn Hahn. Many thanks to my wonderful test knitters: Steve of Dramatic Knits/Leading Men Fiber Arts, LuciaKnits, Patfrag, MarynVoigt, and Jaxie985.